National Gift Card is the best place for you to order Jiffy Lube gift cards in bulk. We are the experts in all things gift cards and can set up your gift card solutions program for you today. Please contact us for more information on bulk, direct-to-recipient, or individual gift card fulfillment for your gift card program. Contact us here or call us at 888-472-8747 today! This Card can be used only for purchases of goods and services at participating Jiffy Lube® service centers in the U.S.No value until purchased. This Card cannot be redeemed for cash and no change will be given, except in those states that require redemption for cash. Except in certain circumstances, the value on this Card will not be replaced if the Card is lost, stolen or destroyed. No fees. No expiration. 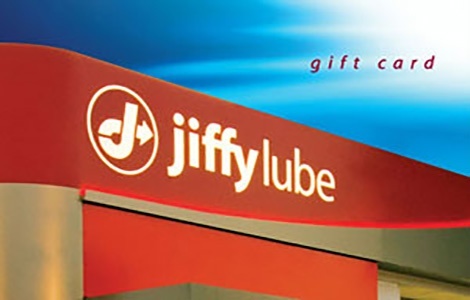 For questions regarding your Jiffy Lube Gift Card, please contact your Jiffy Lube service center, visit www.giftcard.jiffylube.com, or call the Help Desk at 800-544-7537. For remaining Card value, check your invoice or call 800-544-7537.